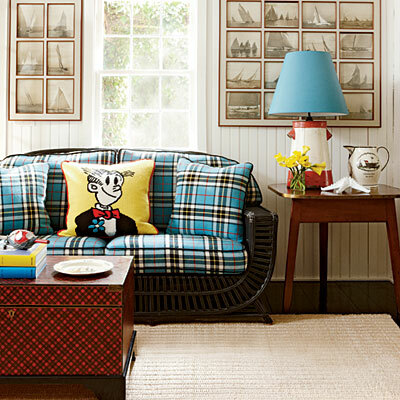 I love the quirky combination of elements in this relaxed living room: The sepia-toned nautical prints; the bold plaids; the vintage container lamp; and the Dagwood throw pillow make me smile! What do you think about this room? It is cute, but I would love to have the tartan coffee table in my livingroom. It is oddly cozy to me, like a fun cabin setting. I must say it is a relief to be back on-line. I normally like plaid but not this one! not my cup of tea but its fun! I think I only like the Dagwood pillow! This is a first...mark it down! That is a lovely blue, I really like it! Any room that has plaid is a winner for me...and blue plaid makes it even better! Interesting because when I look at the elements individually I think--no, but together they look so cozy and inviting. I mean, who would ever think to have that pillow on their couch! I do think those prints with the sailing ships are very cool. Hrmm...I like plaid as an accent, especially in clothing, but mixing plaids makes me cross-eyed. And it's so busy that, to me, it clashes with the nautical decor behind the couch and compete for my attention. It's a fun room, but a bit busy if I was going to use it everyday. I love how the dagwood pillow catches my eye. Interesting....can I leave it at that? Hope all is well, I've missed a lot while I was away. Hope to catch up this week. I saw the stadium where our team will visit this weekend, ummm, not what I thought it would be!